Everyone loves being a part of the “Next Big Thing”. Whether it’s the newest, sleekest iPhone to replace the new one you purchased only 10 months back, “going green”, or bulletproof coffee, we can’t get enough of shiny, bright, new. In many ways it doesn’t matter if the “new” is re-created from something old, like a building made of recycled bamboo. We are addicts for new packaging. This may explain why an almost unbelievable number of brands are intending to budget for influencer marketing campaigns before the end of this year. The Influencer has been around for hundreds of thousands of years. If we think back to the Greek Ages, anyone with a higher status than another could be in a position to influence on the behalf of another. Repackaged and rebranded into the formal role of Influencer Marketer, such a person in position of authority with social klout can pull some serious weight for a brand. Why exactly is The Influencer so valuable in this moment? The marketing industry, and particularly digital marketing, is saturated with paid advertising. As we did away with television ads by getting TIVO and Direct TV, brands moved their messages online. The only problem is, we are so oversaturated with ads on every website that they have become background noise, and we barely notice them anymore, let alone take interest in them. To a great extent, paid advertising is becoming extinct. Much to the contrary, influencer marketing touches the heart of consumers. People are receiving personal messages from influencers they trust and rely on to bring them new, exciting content from around the world. This is no exaggeration. 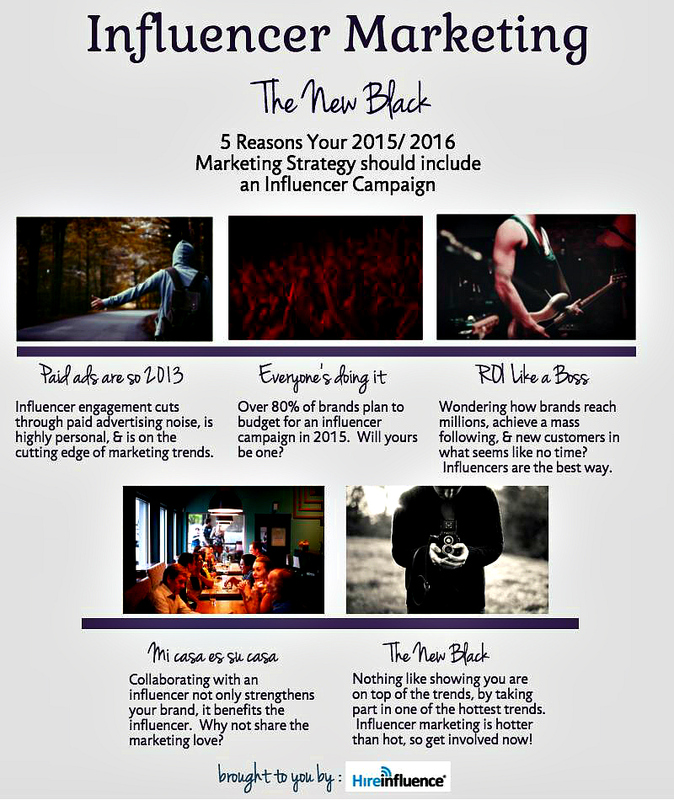 Over 80% of brands are slated to initiate an influencer marketing campaign in 2015. If you keep up with the news, you may have noticed that nearly every day there are multiple articles about influencers, influencer marketing, who’s doing what, who’s engaging with what influencers, and what’s to come in this new, exciting niche. The average ROI of this new trend is $6.50 in revenue for every $1 invested in an influencer campaign. This happens as a result of new leads generated from a campaign. Imagine the impact for your brand if you were to team up with an influencer who has 15M followers. Why is this the case? Aside from the Adblockers and other reasons paid advertising is less impactful, only a mere 10% of people trust brands themselves. This means that brand advertising has far less potency and ability to drive ROI. Where are consumers placing their trust? Yep, that’s right, influencers. The influencer’s social media platforms and the brand’s platforms work synergistically to improve one another’s image. Naturally a brand engages an influencer with a particular goal in mind, and it makes sense to create an influencer partnership that rewards both parties. The brand and influencer both stand to benefit from improved credibility, presence, awareness, status, reach, for example. Once upon a time, the color black was considered the hottest, sexiest color to don, to buy, and be seen wearing. Influencer marketing is to marketing what Blackest (aka Vantablack), a new material that is blacker than black, is to the world of shades. It’s hipper than hip, and so new that’s it’s being talked about non-stop, but still new enough that it is not overdone.